The last week or so has gone by in a bit of a blur but I think it’s finally become real for me – I’m on TV! Nothing oscar worthy and certainly nothing to log off your Netflix for but yes – for the first and probably last time in my life, I am starring in a TV advert! At first it was absolutely mortifying to watch myself on TV – especially when in front of other people – but (now I’ve had a chance to watch it without my hands clutching my face), I’ve realised how tremendously proud and honoured I feel to have been part of it! It’s funny, when my friends watched the advert they were like – I thought these things were always scripted? Surely the actors are PAID to say good things?? And I have to admit, before I experienced this first-hand, I always assumed that too. Prepare yourselves dear friends cos there ain’t no blue screens, background sets or A-listers here. Just plenty of hairnets and fueled-by-Pret poses. Don’t say I didn’t warn you!! One mass email to L’Oreal subscribers and one casting session later – 7 of us Fibrology fiends were selected and whisked to London for prepping and filming. Our hair was attended to by the amazing Robert Frampton – I love how he made my hair fall in defined, big waves! Whenever I try this at home it goes a bit piecey or straight but after eyeballing Robert’s movements the WHOLE day, I think the secret to the sleek finish is something to do with more combing than I normally do! Our makeup was by the uber-cool Louise Constad – seriously, I cannot understate how COOL she is. Again, the style was very different to how I normally do my makeup, but it was really fun to try something new! The Questions You All Want To Know. No, it wasn’t scripted, no, we didn’t get paid and despite what my favourite troll on Twitter says, no, we didn’t wear wigs either..!!! We were essentially interviewed and asked what we thought of Fibrology, on camera – and then we answered with our own opinions! You can actually SEE the results for yourself in the advert – that’s all real hair, no extensions, no extensive backcombing, just several washes with Fibrology and some decent studio lighting. That one, my friends, has Zoe Dubs, Queen of Dorks written alllll over it. As you can expect, there was a lot of waiting around! Who says models don’t eat?! My favourite bit!! Getting prepped by the team! A huge shoutout to the most lovely group of ladies who made the whole experience extra special. A mix of ages, professions and hairtypes – none of us had ever done anything like this before but without them it wouldn’t have been the same. We stuck by each other through the nerves, the early morning starts and, of course, the many, many “I can’t believe this is happening to us! !” moments. 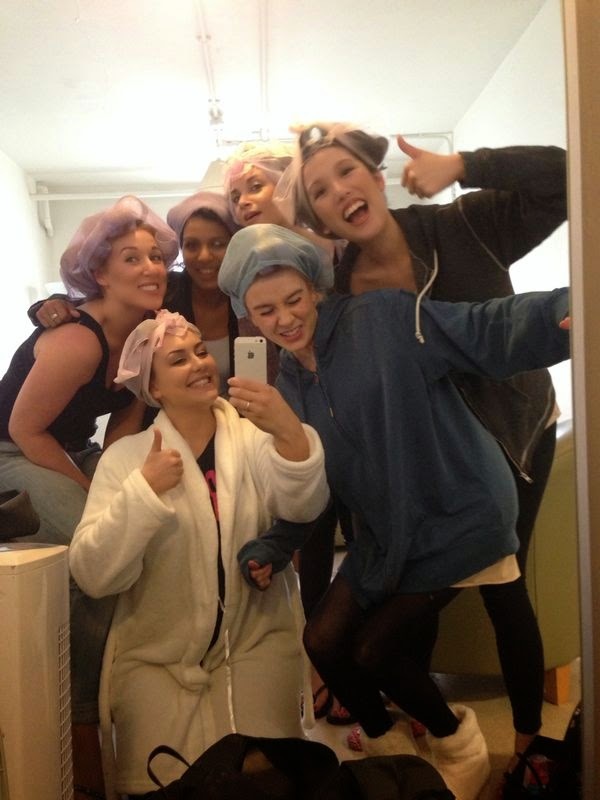 Priya, Lucy, Jade, Emily, Sarah, Charli-Emma – this post is for you. Can you believe it yet?! We on the teevee!!!! So there we go! I’M A REAL GIRL! Oh yeah – and if you haven’t tried the Fibrology range, in case you didn’t guess….. I really recommend it!! Gotta be delicious with Got2b Oil-licious! Next Post Instagramming those holiday pics? New Mobile Data Rules in The EU! OHMYGODTHISISTHEMOSTEXCITINGTHINGEVER!!! !I'm going to be looking out for you, missy! Hehe thanks B! Hope you get to catch it on TV!